The IBM Center for The Business of Government connects research to practice, merging real world experience with practical scholarship. We shaped this agenda by collaborating with government, academic, and nonprofit leaders to identify key areas of need for the public sector to transform. Since launching the six trends agenda, the Center has worked with leading public management researchers, publishing reports outlining practical, actionable recommendations that address many of the pressing challenges government executives face in their efforts to transform government operations and enhance services. We encourage you to review our research areas closely in selecting a topic on which to prepare your proposal. We look forward to receiving proposals in response to this research announcement and to continuing our work with the world’s leading researchers. Since the creation of the Center, it has been our goal to document and better understand the transformational activities and initiatives now being undertaken by innovative government leaders across the world. It is an exciting time to witness the continued transformation of government as it becomes more citizen focused, results oriented, performance driven, and collaborative in nature. 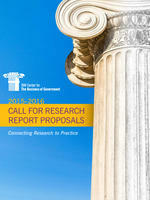 We look forward to receiving proposals that continue our partnership with leading public management researchers. Our next deadlines are October 1, 2015 and April 1, 2016.